BOSTON — With another Game 7 victory at stake, LeBron James would not miss. He would not sit out. And he would not be denied an eighth straight trip to the NBA Finals. In the first close game of the series — and the lowest-scoring — James played all 48 minutes and had 12 of his points in the fourth quarter for his sixth straight Game 7 win. 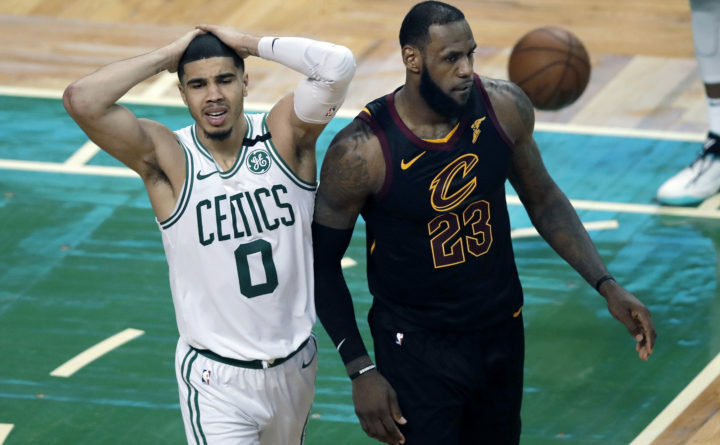 Jayson Tatum scored 24 for Boston, which was looking to return to the NBA Finals for the first time since 2010. Al Horford scored 17 points and Marcus Morris added 14 with 12 rebounds for the Celtics, who led 72-71 with six minutes remaining before the Cavaliers scored 15 of the next 17 points to pull away. James and Horford embraced after the buzzer, then the Cavaliers donned NBA Finals hats and Eastern conference championship shirts before shuffling off the court to receive their trophy. James had to do it without Kevin Love — Cleveland’s only other all-star — who sustained a concussion in Game 6 and was replaced in the lineup by Jeff Green. Making his first start since the first-round opener against Indiana, Green scored 19 points and added eight rebounds — the star of James’ starless supporting cast. Cavaliers: Shot just 2 of 17 from 3-point range in the first half. They made three of their first 22 shots before James and Green connected on back-to-back attempts midway through the third quarter. Celtics: Paul Pierce, whose number was retired by the Celtics this season, cheered the team on from courtside. … Rapper 21 Savage was also at the game. … Boston was 7 for 39 from 3-point range, with Terry Rozier missing all 10 of his attempts.